Are The Nobel Science Prizes Obsolete? Meanwhile, the Peace prize is a worthy idea (even if the execution often leaves something to be desired), but what about greater recognition for work done in public health or, say, biodiversity loss? Right now the Peace is sort of a clumsy catch-all for these categories—Al Gore and the IPCC won in 2007 for climate change, while Medicins San Frontieres won in 1999 for its medical work, but these aren't quite the same thing as peace. As one philanthropist in the article notes, it's a bit weird that, if malaria was eradicated, the only major award the effort could qualify for would be, rather awkwardly, the Peace prize. And yes, yes, this should all go in the context of Jon Chait's wonderful column today arguing that we should scrap the whole concept of prizes. 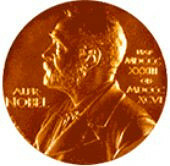 But the Nobel's not going anywhere, so why not modernize it? It's not like Alfred Nobel's will is too constraining—the economics prize has long managed to sneak into the festivities, even though it's not "technically" a Nobel.